From aircraft engine parts to a comprehensive range of automotive parts and systems, and home appliances. 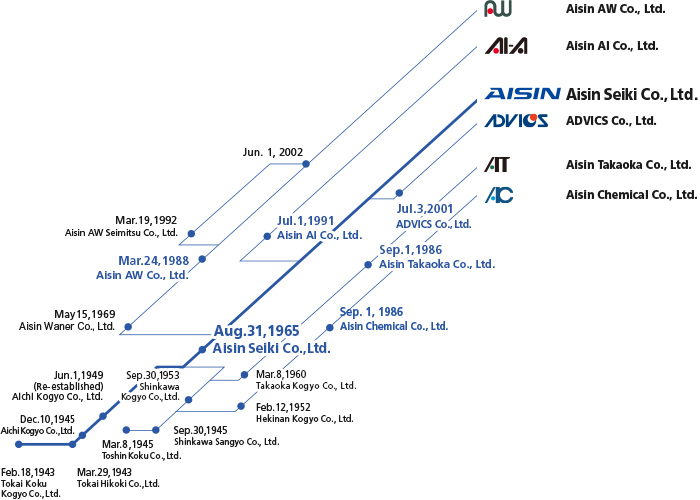 AISIN SEIKI's history begins in 1943 with the founding of Tokai Hikoki Co., Ltd., an aircraft parts manufacturer. With changes to the Japanese market following World War II, the company switched from aircraft parts to automotive parts and sewing machines, and the company's name was changed accordingly in 1945 to Aichi Kogyo Co., Ltd. Subsequnetly, the company expanded its business products in the automotive parts and systems, and home appliance fields. Aiming to further strengthen its business structure and give increased impetus to its activities, the company merged with Shinkawa Kogyo Co., Ltd., in 1965 to form a new company: AISIN SEIKI Co., Ltd. By adding clutch and body related products to its armory of drivetrain, chassis and brake products, AISIN SEIKI became one of Japan's leading manufacturers of a complete range of automotive parts.